Children, parents, and teachers will enjoy this beautifully illustrated book that teaches the value of "positive time-out" to help children learn self-soothing skills. Co-authored by Jane Nelsen and illustrated by political cartoonist, Bill Schorr. 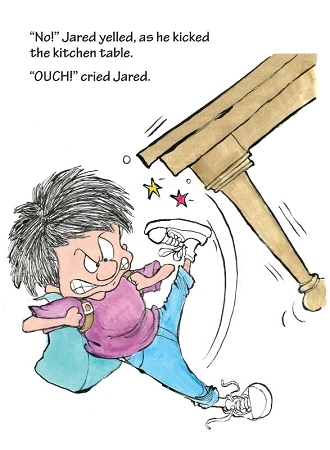 Why is Jared so mad that he kicks the kitchen table? Discover how Jared travels to space to manage his anger and comes back with an idea for a delightfully creative birthday present for his dad. A special gift that will inspire children to create their own Positive Time-Out space for self-regulation. 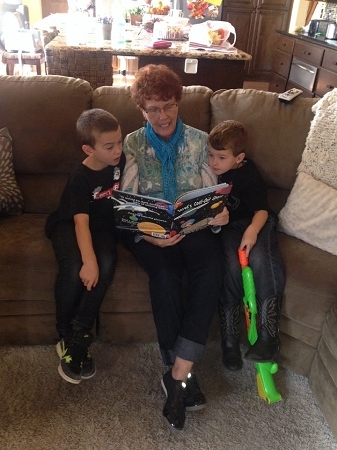 Dr. Jane Nelsen reading Jared's Cool-Out Space to two of her grandchildren. Time outs can be positive! Such a creative way to teach children that time outs can be a positive thing, instead of viewing it as a punishment. I love the idea of having the kids help create their own cool-out space. I think once they have their place, they will actually be more aware of the times they need to use it. The book also has such a cute reminder that we ALL need space to cool down sometimes. Maybe I'll make myself a cool-out space today! My Kids Could Not Wait To Get Started! I read it to my children at bedtime tonight and they BOTH loved it. Not only that, they have big plans for redoing their cool down spots tomorrow and can't wait to get up in the morning and help each other. It's not often that they enjoy the same book these days, so it was pretty cool to see what a hit this was with both. Great tool for helping parents have this conversation with their own kids! every household and classroom needs this book! My 4 year old proudly announced, "This is my favorite book. Ever." She renamed her positive time out space to "princess land" where the "anger melts into the princess air" and then designed a time out space for my husband- just like Jared! As a parent educator and school psychologist I share this book with teachers and parents as a must read with their children. Kids immediately connect to it- and it taps into over 15 parenting tips and tools. It is my number 1 holiday gift this season! This is such a great book! I have raised my kids with Positive Discipline for the last 6 years, and after I read this story to my 8 year old, he said, "The boy reminds me of me, and the mom reminds me of you!" He recognized himself and his big emotions in the illustrations and couldn't wait to read it to his dad when he got home from work. What a gift! I love this book! On the surface it's a simple, common story of a frustrated child learning to self regulate. More importantly it's an understandable model of many Positive Discipline tools that I teach WITH A GLOSSARY AND DIRECTORY OF THE TOOLS! Brilliantly done! I will be stocking up for clients and friends! This is such a great book. Not only for the lesson it teaches but the skill of being able to calm yourself down in the heat of the moment. This book is a must have for any parent or teacher on the planet. It should be in every home and library! Thank you Jane.